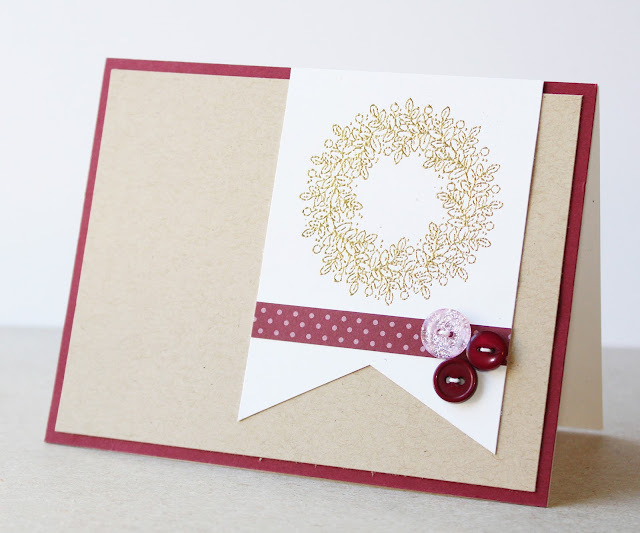 This card would be very easy to mass produce if you are looking to make a lot of Christmas cards but don't have a lot of time... which is usually my position! Every year I feel like I'm prepared, with all my cards ready to go... until I realize I'm 10 or 15 cards short! Then I have to scramble to finish the rest. Hopefully this is the year I learn my lesson! I hope everyone has a safe and fun Halloween. See you next week! because the presentation was just so pretty? to myself "this ribbon would make a great card!" This could not have taken more than five minutes to put together. 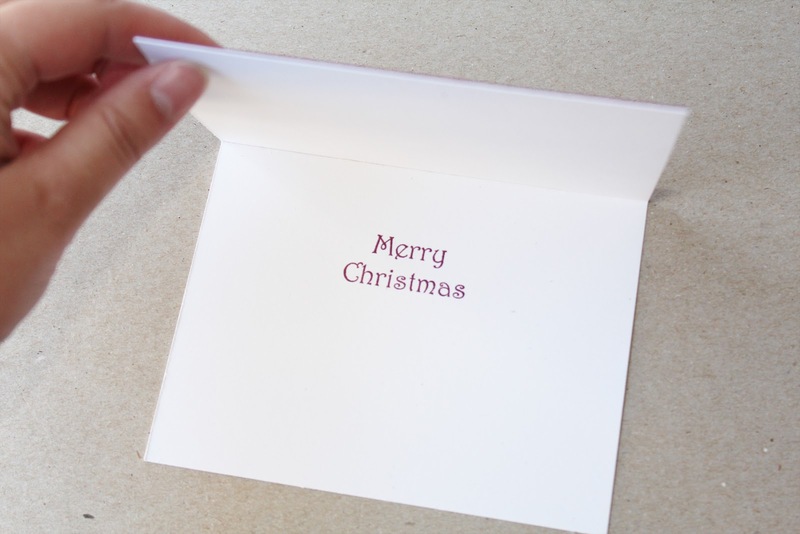 Doesn't that ribbon scrap really make the card elegant? I love how the ribbon pops with the black and white. Not to mention that beautiful and touching sentiment. 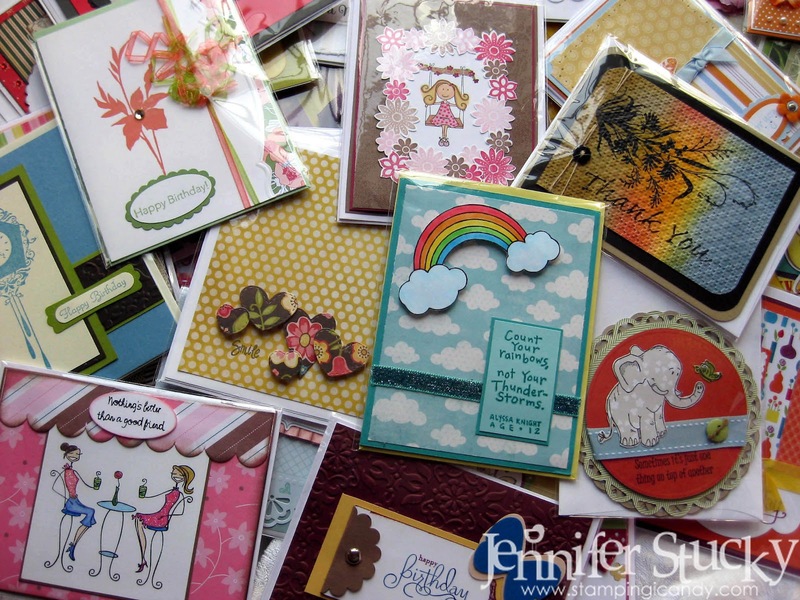 stamp here at our Great Impressions Stamps store! on a hop. Mark you calendars now for November 28th! for you to play with us. Check out the top of our blog for all the deets! midnight Wednesday to show us your Fall style! Lotsa fun stuff coming your way! Happy Monday. Halloween is only a couple days away. Are you ready??? We are. We have even gone to a couple trick or treat parties and some community events already. 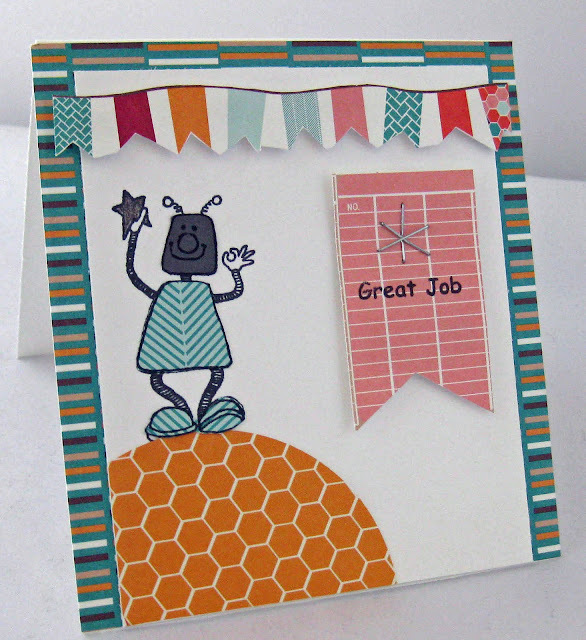 This stamp is so fun and exciting and great for anyone. The stamp used is Instant Witch. I used some brand new Echo Park papers, colored the image with copics, and added some Impulsive Purple glitter. The black ribbon was just for a border and a good friend Barbara gave me the idea for the broomstick (I used black cardstock, orange twine, and part of a Capri Sun straw). Hope everyone has a wonderful Halloween! update. It's been like an early Christmas for me. and oohing and aahing over each one! I put them in cello plastic sleeves to keep them safe. Here are some pictures of the cards all "dressed"
and ready to be packed up. 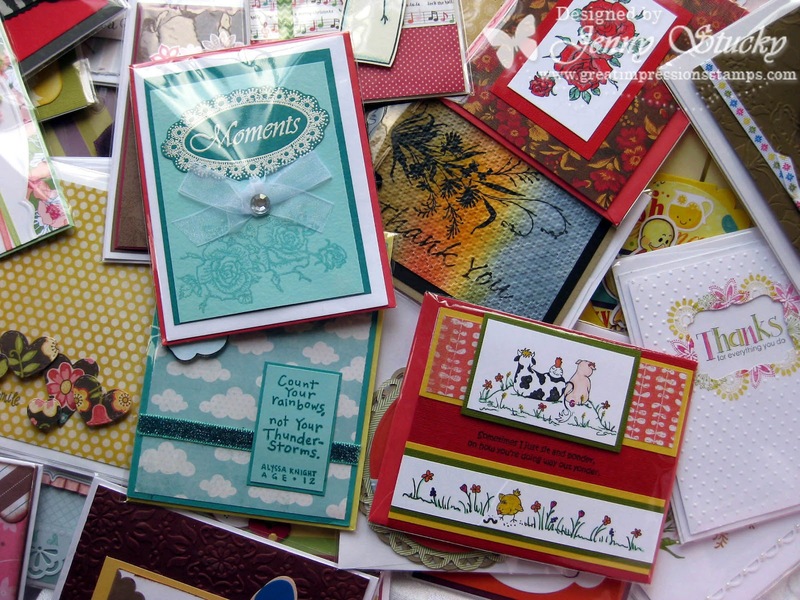 Can you guess how many cards we will be donating? A whopping....wait for it..... 278 cards! I recently had foot surgery so the cards have not been delivered yet. to take more pictures so I can share them with all of you. Hello There-Good Morning to You All! Welcome to my Saturday Great Impressions jammie day post. 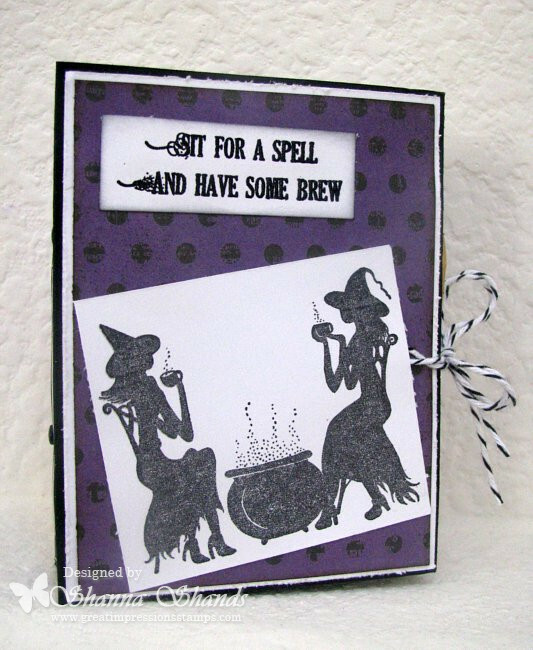 Hope you are all have a nice, relaxing Saturday morning planned, maybe even with a nice hot cup of cocoa and a bowl of oaties-browsing a few blogs! Always nice to kick back for a while before you hit the ground running, isn't it?! 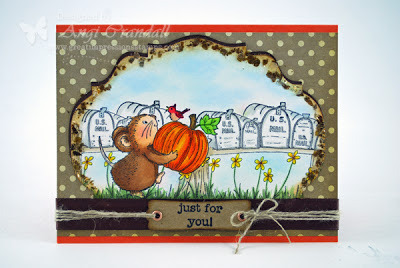 I think you all know I have a love for these little meece images and I love how this sentiment swirls around the paper! So fun! I made a simple creation today-I think the sentiment needs to shine on it's own. The card base was cut out of a pretty My Minds Eye DP. I glued the top scallops together to form the card. I added the light background piece from Aunthentique Enchanted to the base with pop dots after adding a fun little strip of MME DP and gold cording. My little meece and nestie star are then added with pop dots as well. I finished this off by adding a pretty pearl in each corner. Thanks for stopping by today-I hope you have a great day! To check out our Great Impressions October Fall challenge click HERE. Only flurries, but the temperature dropped and out came the wool sweater and slippers! Guess it's time to dig in and get to some serious crafting in the studio! One of my favorite things about using stamps is the ability to combine images by masking. Once you know how to layer your images (foreground to background), you can customize any project by mixing and matching. 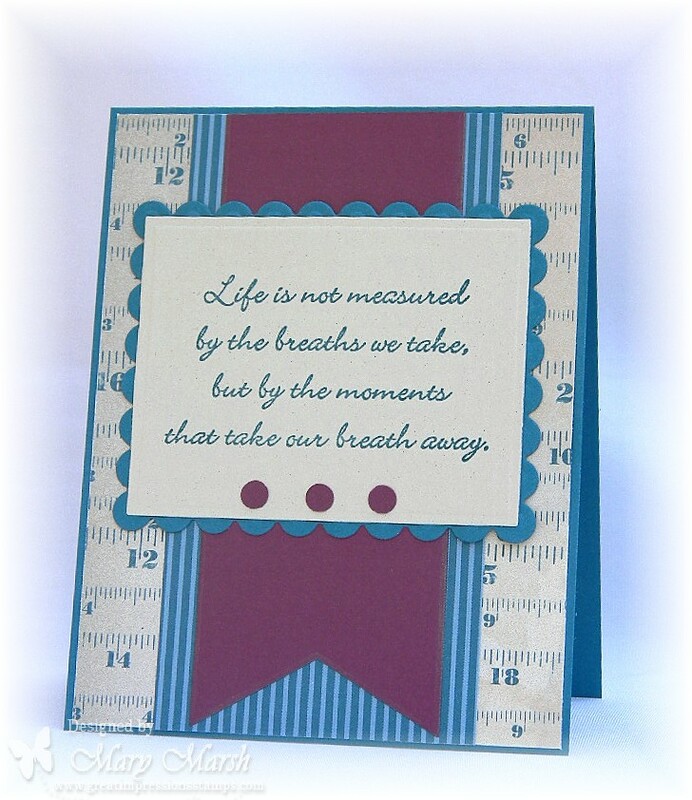 and part of the Just For You (C370) Stickable for the sentiment. When I first saw Harvest Mouse I thought he should be gifting this sweet pumpkin to a friend...now he is! 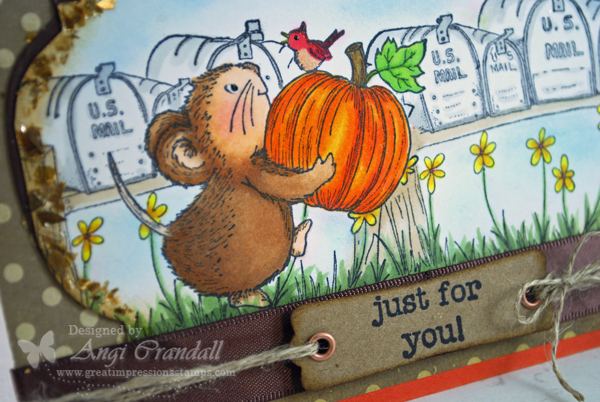 First I stamped Harvest Mouse. Make a mask by stamping on a sticky note (make sure part of the image is actually on the sticky part. Just sayin'.) and then trim out the image. Place the sticky note image over your stamped image. Ink up the Mailboxes and stamp it once on the left. Ink it up again and stamp on the right. Lift up the mask and ta-da! Harvest Mouse is on his way to the Mailboxes! The edges are sprinkled with Frantage Bronzed Mica Fragments. I love the vintage glam. It's hard to see in photos, but I used Spica Pens to add shimmer here and there, too. That little strip was a leftover from trimming the front panel. Works great here! Time for a refill on my hot chocolate. There's still time to enter the monthly challenge. Can't wait to visit you! Echo Park - Cynthia B. 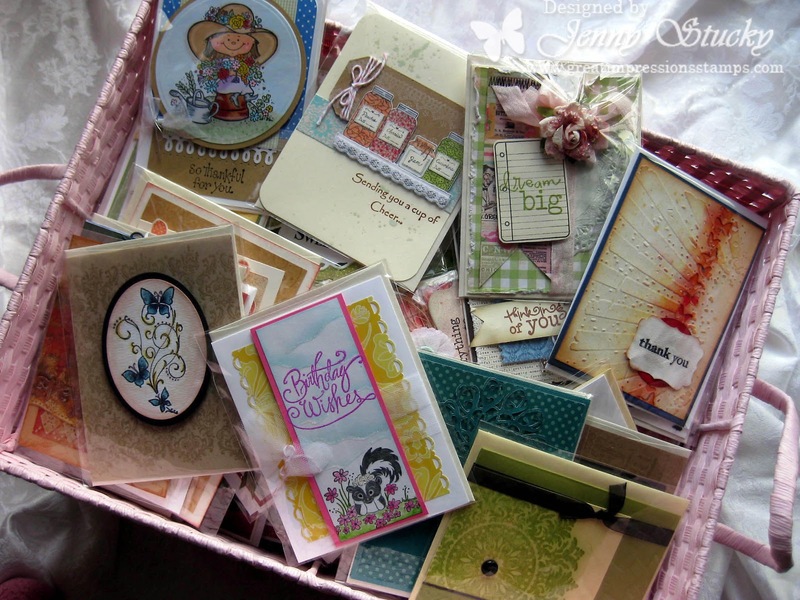 Great Impressions Stamps - Cassie D.
Great Impressions Stamps - Kim H.
A Design Team member will be contacting you soon. 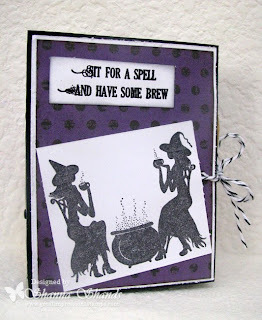 Now....scroll on down to see what magic Erin has created for you today! Happy Wednesday, friends! 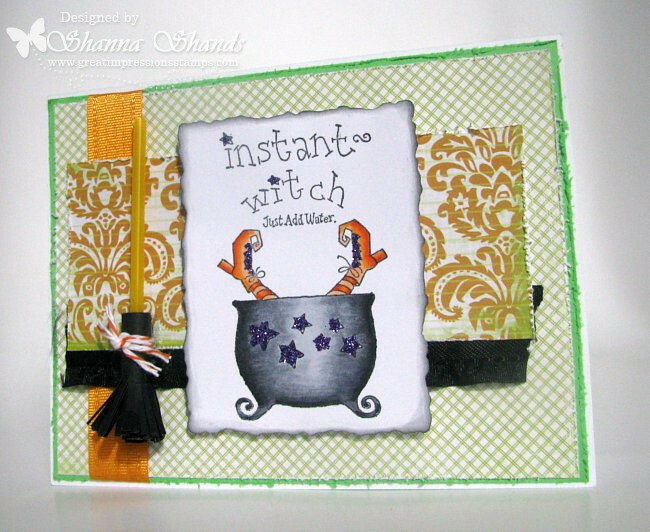 The card I created last week was very layered with lots of "stuff" on it... so this week I went in a completely different direction. Clean, simple, and monochromatic. Sometimes less is definitely more! 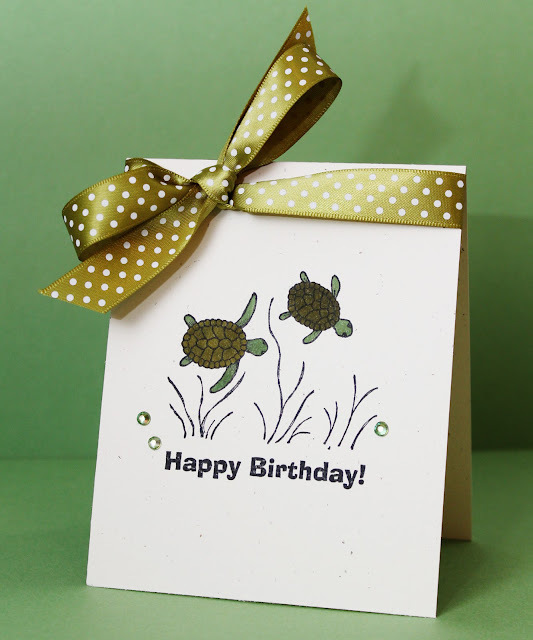 I used two Great Impressions stamps: Swimming Turtles and Happy Birthday. In real life the ribbon matches the color of the turtles &amp; gems. Here is what you all have been waiting for! choose two lucky winners from their blog comments. 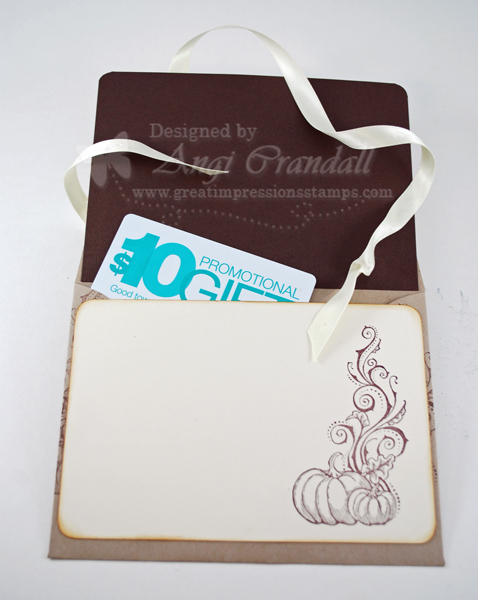 a set of holiday stamps from Great Impressions Stamps. Great Impressions Stamps - Joan V.
Great Impressions Stamps - Stephanie C.
with instructions on claiming your prize! to see if you made the list! I'm stepping out of the Fall/ Halloween norm today! my trusty Copics. I added to the sentiment with some Thickers. Silly me thought they were just plain 'ole white stickers. Not! until I tried placing them on my card. 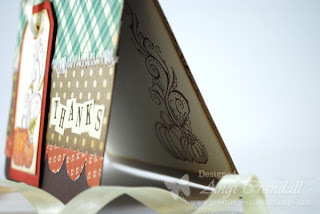 some embossing powder which took care of the "stick". These would work great with a sparkly glitter too. Have you entered our monthly challenge yet? If not, show off YOUR Fall style by joining in! Who knows, you may win some Great Impressions Stamps! 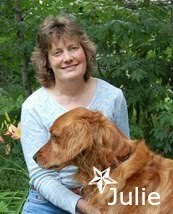 I love to browse through the entries and grab some inspiration! Is everyone ready for Halloween???? I have already had to replace some of the candy as I have a bit of a sweet tooth. I know I am bad right. Poor kids. I know I will end up eating some of my daughters candy as she is a sucker and smarties kind of gal. Well this is a creation I made in honor of Halloween. I really loved making this tea bag holder. I just had to use these two stamps for the tea bag holder. 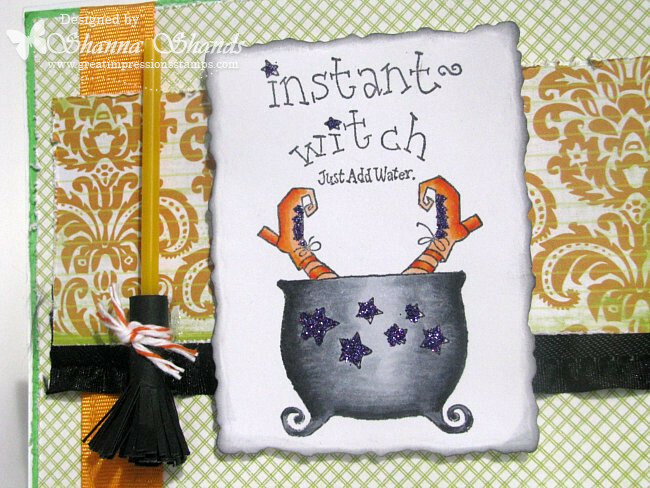 I used this tutorial here! It is so quick and easy to make. So try it out! 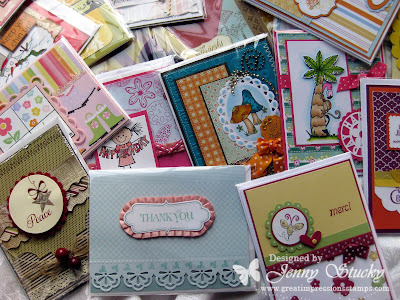 Great Impressions Stamps Blog Hop is still going strong! You've got until Midnight (Eastern Time) tonight to finish the hop! If you are looking for some fresh holiday inspiration this is the place to be! Click here to get on your way! The winners will be announced later on Monday right here! 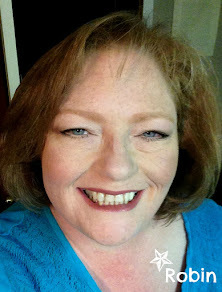 Good Morning and welcome to my Saturday Great Impressions jammie day post. This morning I am really hanging out in my pj's and doing a little surfing! How 'bout you? What are your plans today? For my card today I used papers from the Echo Park Very Merry Christmas Kit that I got for the Great Impressions/Echo Park DT blog hop. I framed this happy Wintery Snowman in the red polka dot paper and used the great green tree paper for the background. I added the sentiment on a slant and tied on some real jingle bells with some May Arts twine. I also added a snowflake cut with my Silhouette and blinged it up with some sparkly crystals. I intended to add glitter to the hat, but geez-looks like I forgot! You still have time to leave a comment for a chance to win an Echo Park kit and some Great Impressions stamps. You can read about it HERE on my post. To start at the beginning of the blog hop click HERE. 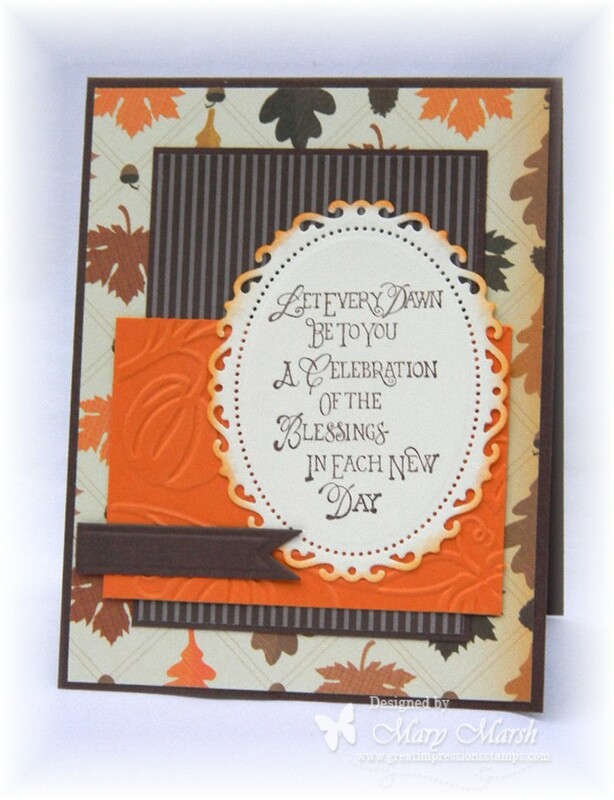 To check out our October Fall challenge click HERE. 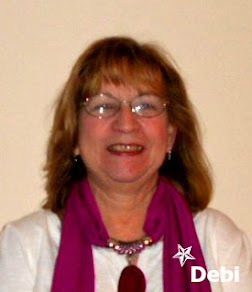 Thanks for stopping by today-I always enjoy hearing from you! 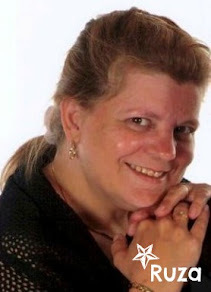 Happy Friday and thanks for taking the time to visit the Great Impressions blog. 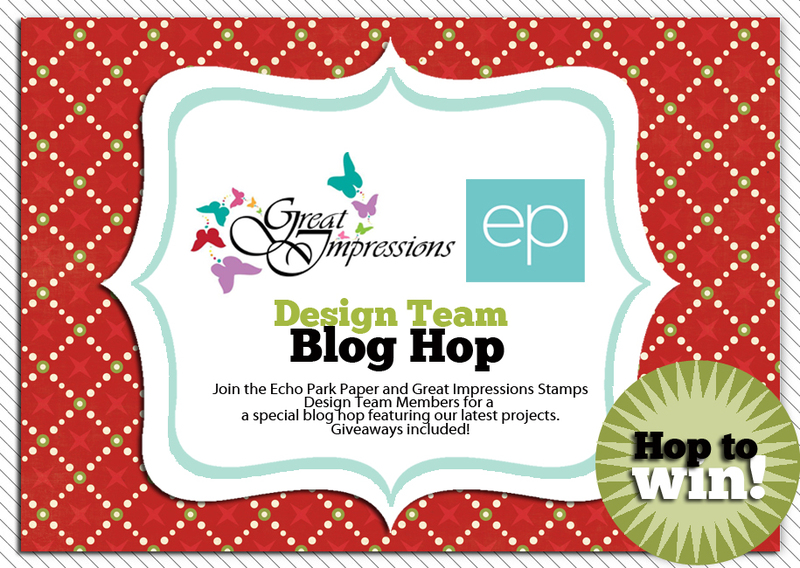 Hope you had time to follow the Echo Park Paper/Great Impressions Blog hop this week. There will be a winner from each designer's blog. You have until Sunday night at midnight to comment. 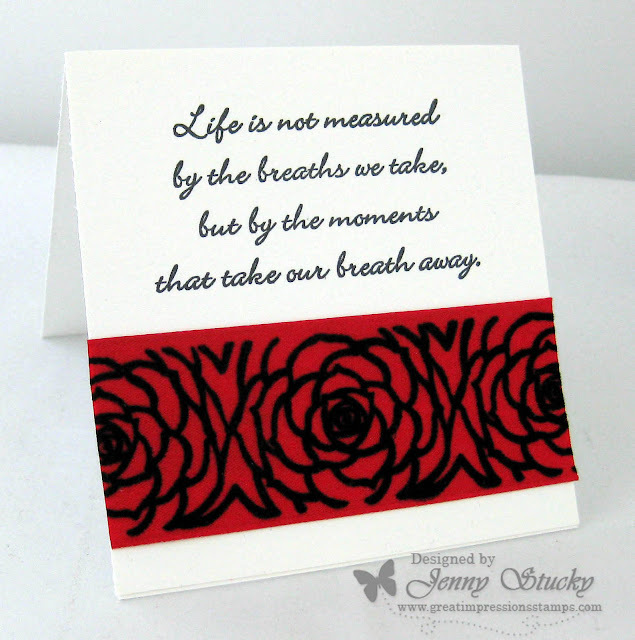 My card for today is using the Great Impressions Stamp - "life is not measured"- F252.﻿ I love how you can make the sentiment the focal image on a card. 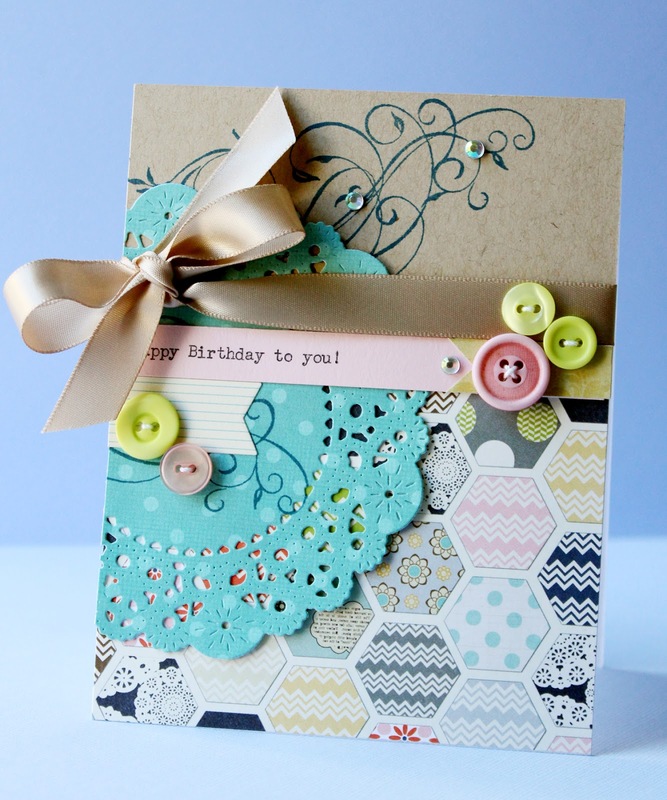 Add some designer paper, a die cut and you have a great card. 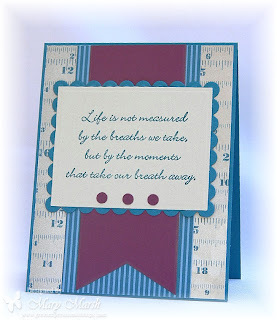 I played on the measurement theme of the sentiment by using designer paper with measurements on it. I added a flag pennant to complete this cas layout. That's it for me today. Hope you have some fun plans for the week-end. The Echo Park and Great Impressions Stamps blog hop is still open! Find the details in THIS POST. With friends and family scattered across the globe, gift cards are a lovely alternative, but they can be a little low on the 'WOW' factor when you receive/give one, right? 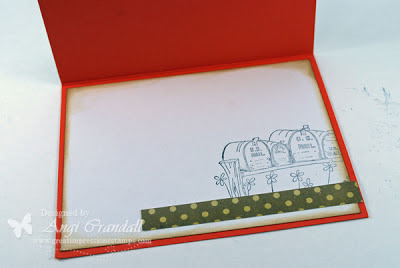 How about a decorated envie (aka envelope) to dress up that drab little card? I attached cardstock to the top and bottom side of the flap. 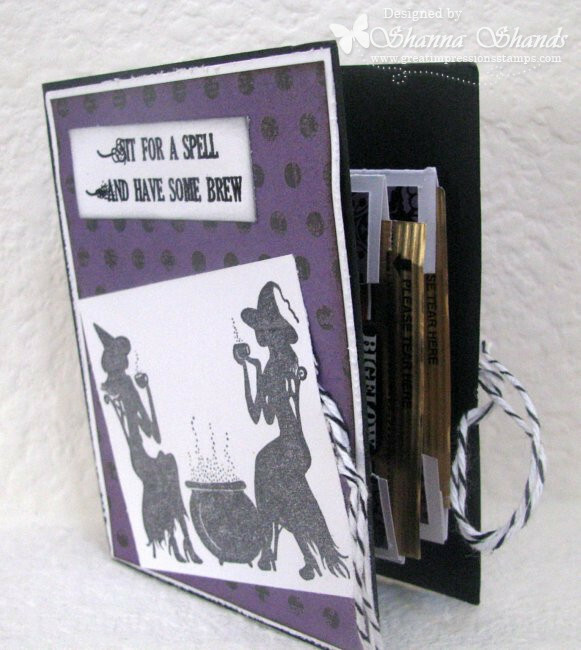 I prefer not to leave the inside of my cards nekkid. Same went for my envie! 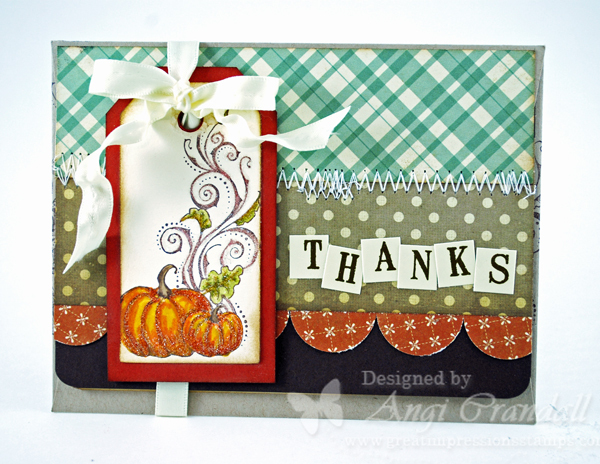 I used Pumpkin Flourish (F500) to stamp the tag and the inside. Have you entered our Monthly Challenge - Fall? There's still time to link up your project! What are you doing to make your gifts a little more special? Hey everyone! 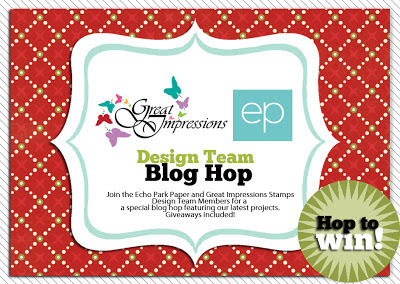 I hope you guys are enjoying the Echo Park + Great Impressions Stamps blog hop! I have loved looking at all the projects... amazing inspiration! I didn't realize the sentiment is partially covered by the bow in this picture, but it says "Happy Birthday to you!". click here. Otherwise, scroll on down. EEk! I am a loving that my son got a great mid-term report card! I created this card to let him know how proud his Dad and I are of him. and colored up the other star with a silver glitter pen. Is everyone having fun checking out our holiday hop with Echo Park? I'm swooning over their papers! You've got all week to hop along. to win some Echo Park and Great Impressions Stamps presents I mean... prizes! !